Grant Simon is a textbook example of a multi-unit franchisee who can't sit still. When we profiled Simon in 2008 (Q3), he was operating 18 Great Clips salons in the Atlanta area. He was doing well but had an itch for more, and had just teamed up with fellow area Great Clips franchisee Greg Thomas (profiled in 2011, Q3) to purchase a car wash business. "It looked like a good opportunity, so we did it," says Simon. "We turned it around and quickly sold it for a healthy profit." It was an omen of good things to come. The two entrepreneurs invested their proceeds in Great Clips salons outside their Atlanta market and the growing began. Since the end of 2008, Simon has opened 21 more Great Clips salons in Georgia, Florida, and Alabama through new builds and acquisitions, bringing his total to 39. He didn't stop there, adding Smoothie King to his portfolio of brands. He and Thomas bought a distressed Smoothie King in Atlanta, turned it around, and sold it. "That strategy worked so well for us that we did it two more times," says Simon. Today, the partners operate a single, money-generating Smoothie King and are looking to expand. But wait, there's more for the busy entrepreneur. He's also become involved with T-Mobile. Although T-Mobile is not technically a franchise brand, he says it operates much like one and fits into his portfolio perfectly. After opening 11 T-Mobile stores in Atlanta, Simon recently merged with fellow T-Mobile Premium Retailer Lou Provost. 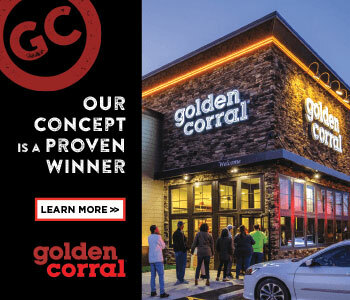 "We now have 20 stores in Georgia, Tennessee, and Alabama with plans to expand into Florida in 2014," he says. The Simon and Thomas partnership has gone so well that the partners formed LSGF Management in 2012 to house all their franchise brands and other businesses. "Forming this company just made it easier for us to manage and oversee all the things we were involved in," he says. "Greg and I share the same entrepreneurial sprit and values, but our skills and strengths are different and complement each other, allowing each of us to focus on what we do best, and the company benefits." For now, Simon is busy overseeing three brands with 60 locations in four states and says there's more growth on the way. He just celebrated his 20th year with Great Clips and is looking to open more salons. 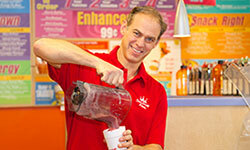 The right Smoothie King location also is a good target for expansion, and he plans to open 15 more T-Mobile locations in 2014. "I've been in growth mode for the last 5 years," he says. Don't look for that to change any time soon. My father always worked for himself and has excellent business acumen. He taught me how to negotiate, how to manage, and how to take chances while controlling risk. My mother taught me about integrity, honesty, and tolerance. I kept my original general manager a little longer than I should have. I accepted mediocrity and problems longer than I should have. When she did leave it really rejuvenated the company and gave a fresh start to everything. It was a better place for all of us to work. The second Great Clips location I purchased was to relocate the business. But after I got in there and really evaluated it and talked to the people, we decided to keep it there and it became very successful. Demands on my time change dramatically depending on what is going on with the business. I usually work six days a week. I try to work in quality time with my family and friends. I love what I do, so it does not seem like work to me. There is no typical day and that suits me just fine. As a multi-unit franchisee, I spend my day multi-tasking. After catching up on emails in my home office, I head to the corporate office where I review store metrics and meet with staff and vendors and focus on operations, financials, construction, and real estate matters. I like to do store visits whenever I can. Traveling, hiking, scuba diving, photography, skiing, and watersports. I work out regularly at the gym and enjoy a variety of sports including running, cycling, tennis, and racquetball. I don't sleep much. I'm always excited about whatever I am working on. I am passionate about doing deals. Also helping others around me grow and succeed. I work hard and play hard. My home, my office, my gym, and my daughter's school are all within 5 miles of each other. Puerto Rico with my brother and father to celebrate his 75th birthday. My mother. And I do, once a month. Long-term cash flow almost always trumps profits from a sale. I prefer to open and acquire businesses to operate long-term. Always be prepared for tough times by keeping operations lean and debt to a bare minimum. Never do a deal that you have to stretch yourself too much for or that just doesn't feel right. Focusing on what I do best. Hire people better than myself for the rest. Building a strong infrastructure to handle our growth. Just one? I am always looking to do better in everything I do. Currently working on improving IT and loss prevention. I am loyal to the people who helped me grow the business, and I don't micro-manage them. If they want to try something new, I'll help them think it through, make sure they have the resources they need, and then I get out of the way. Pretty close. I have a chief operations officer for each of my brands. They are excellent at what they do and we are in daily contact. This is really controlled by our franchise brands, and they do a great job. They screen and evaluate, and the contracts and pricing are always well-executed. I like to hire driven people who have career ambitions. Once I determine someone needs to go, I do it quickly. Again, all of my brands provide great training tools and we make sure to always train up to those standards. We make sure all our people are well-trained, and we always reinforce that training. We have a structured corrective process that will either lead to their improvement or termination. Not doing what you told me you were going to do. Continued growth through new stores and acquisitions. I hope to have at least 15 new T-Mobile stores by the end of 2014. That will put us at 35 units. I also plan to open at least four new Great Clips and look for more acquisitions through resale opportunities. I don't just look at number of units or revenue. Same-store profitability growth is my most important growth meter. I will definitely continue to grow. The brands I am in all have great potential for future expansion. I could see 100 units in 5 years and 200 units in 10 years. I also plan to spend more of my time in charitable activities. Our employee base has been more stable the last 5 years. Great Clips and T-Mobile are great national brands with great value propositions for customers in these economic times. We have continued to grow same-store sales despite the economy. At the same time, we have seen some of our direct competitors retract, giving us more employees and customers. Most of our new unit growth is reliant on shopping center construction. We are just starting to see some new opportunities in all the markets we are in. Great Clips is really a value-based brand, so even when the economy caused people to increase their haircut cycle time, we were able to pull in customers who were seeking more cost-effective hair care solutions. So in a sense, the economy over the past few years actually helped us some. Now that things have turned around, we've kept those new customers who found out what a great product we had to offer them. That's a broad question. We are teamed up with strong brands that have strong management in place. Because of that, our growth and expansion efforts are made easier because we have such great brands with great reputations and products. Don't really have to deal with that. I don't like debt. I have grown mostly through cash flow, and a couple of our acquisitions are done with some seller financing. Rarely. I don't like covenants. It varies a little depending on business. In general, we offer a full array of benefits including vacation, holiday pay, and insurance. We also have contests, incentive trips, bonus, commission, growth opportunities, and a very caring and nurturing culture. We have looked at all of our expenses and cut from nonessential areas. Raising prices has not really been an option the last few years. We recognize outstanding employees and stores in both daily emails and weekly newsletters. We reward them with lunches, dinners, contests, events, and trips. Recognition helps motivate and retain our top performers. I love what I am doing and have no plans to exit in the foreseeable future.